You are currently browsing articles tagged Ingrid Lucia. Ingrid Lucia with her band at Preservation Hall in New Orleans. Photo by David Lansing. I’m sitting at the bar at Sylvain drinking a Negroni when I get a text from Christine: Do you want to go to Preservation Hall with me tonight? One of my best friends in the world, Ingrid, is playing. Ingrid used to front a band called The Flying Neutrinos–jazz, swing. So, yeah, sure, I’ll go to Preservation Hall to listen to Ingrid. Christine says she’s playing three sets and maybe I could meet her there in time for the second show. Which is what I do. 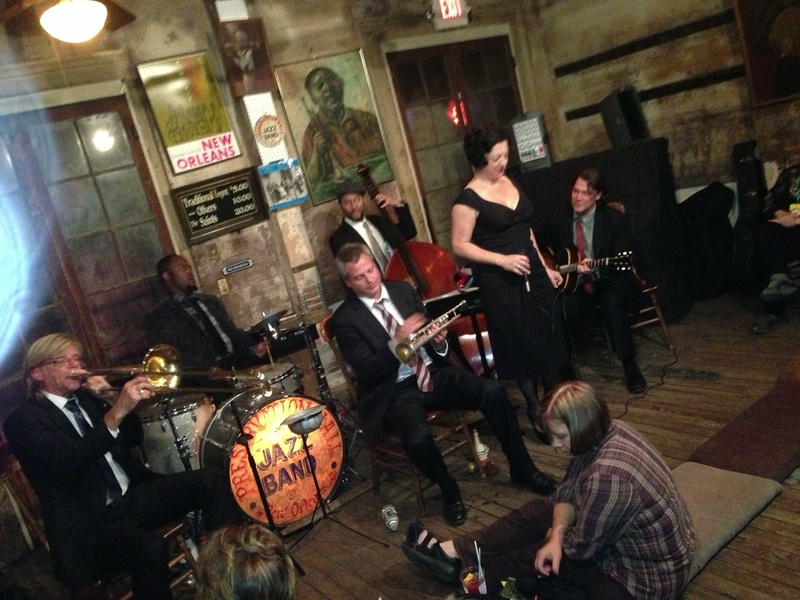 So…Preservation Hall. Not at all what I imagined. I mean, it’s small. Tiny, really. Just a small room with scuffed wood floors and a few rows of folding chairs, a couple of women sitting on the floor, a few other people standing in the back. Maybe two dozen of us total. To listen to what is far and away the best jazz music I’ve heard since I’ve been in New Orleans. Soft, sweet, with this painful edge to it–very much Billie Holiday-ish. I love it. I love Ingrid. But listening to her and her band is painful. Because they are so good and making so little money doing this. Such an underappreciated gift.